Which is: When you have the urge to post a comment that is off-topic to the conversational thread, don’t. Per the comment policy, I will likely delete it or at the very least sigh exasperatedly and be very cross. You don’t want me to be very cross at you. Because then I get like this. If you absolutely positively can’t wait until I post a topic for which your comment will be germane, then you may e-mail me your off-topic comment, because in e-mail, it won’t be off topic. Yes! E-mail still does exist! And every single page on the blog has a link to my contact information! It’s not difficult to find! Many of you know that I live in Speaker of the House John Boehner’s congressional district of OH-8, and that Boehner’s got the seat probably for as long as he wants it — he’s been in it for 22 years, and it’s been held by a Republican since 1939. But it may interest political junkies to know that in 2014 Boehner will have a GOP challenger in the primary: Eric Gurr. Mr. Gurr apparently believes Mr. Boehner is too soft on things like Obamacare and immigration, so he’s tossed his hat into the ring. Two thoughts: One, it’s lovely to live in a country where anyone can challenge the seat of one of the most powerful politicians in the county, without fear of being literally slaughtered. Two, the dude is going to get (figuratively) slaughtered in the primary, because whether or not Boehner is in especially fine odor as Speaker of the House, he’s a reasonably good reflection of the Republicans in his district. Also, you know. Speaker of the House, fine odor or not. Chances are pretty good he could rally some significant capital (political and financial) to brush back a primary challenge. That said, given the relatively rudimentary nature of Mr. Gurr’s site, I don’t suspect Mr. Boehner is too worried at the moment. I’ve heard some murmurings that Boehner may be out as Speaker after the 2014 elections, and that he may consider retiring from Congress ahead of that eventuality. But you know what, I’m going to believe both when I see them. In the meantime, I will be deeply surprised if Mr. Gurr’s candidacy gains much traction. It would be interesting if it did, mind you. For all sorts of reasons. But I don’t suspect it will. A couple of months ago, Lauren Beukes, author of several fantastic books and recent winner of the Clarke Award, contacted me about wanting to do something similar to The Big Idea for her home country of South Africa. I told her I thought this was a great idea and encouraged her to do it, albeit with a different name so there would be no confusion. Lauren’s followed through on the idea, and now on her Web site presents The Spark, focused on new books from South African authors, who are talking about those books in their own words. 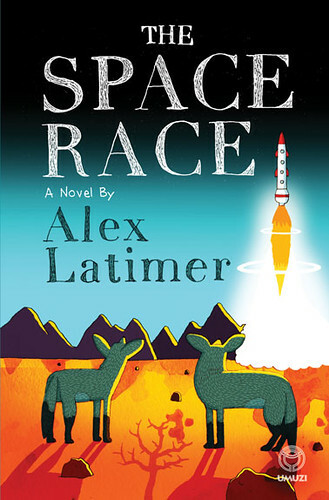 The first book featured is Alex Latimer’s Space Race. Others, hopefully, will follow soon. Congratulations to Lauren for getting this off the ground. I look forward to more Sparks. For the record, I very happily encourage authors and bloggers to take the “Big Idea” concept and adapt it for their local markets and/or fields and/or languages — I started doing it because I wanted to help promote new books and authors. So the more people doing that, in more places and languages and topics of interest than I could ever cover, the better. I do recommend calling the feature something other than “The Big Idea” if only to differentiate between each of us, but the actual idea itself? Take it. Use it. Promote authors and their works. It’s a good thing to do, for the writers and the readers. Back in 2001 a small online science fiction magazine became my very first publisher of my science fiction: Strange Horizons. Then, as now, the magazine was funded by contributions — and right now the magazine is having its annual fund raising drive to generate the budget for the next year. I’m giving SH editor-in-chief some space today to talk about the site and what it does, in the hopes that you’ll see the same value out of it as I do and help keep it going for another year. Hi! I’m the editor-in-chief of Strange Horizons, and I’m here to ask for your money, to support what will be our fourteenth full year of publication. The funny thing about crowdfunding an ongoing venture like SH is that it gets both easier and harder over time. Easier, because you build up a reputation and a community: you become more of a known quantity. Harder because you have to keep and grow that reputation and community. Hence posts like this. So what does another year of Strange Horizons mean? It means another year of a magazine committed to diverse voices. This year we’ve had contributors from Australia, Cameroon, Canada, Israel, Japan, New Zealand, Sri Lanka, and Sweden, as well as the UK and US. We’ve published writers of color, queer writers, and non-neurotypical writers. We want to do much more of all of that, because we believe the best sf is written by everybody, that we need a global, inclusive tradition. It means another year of more than just fiction. We publish new issues each Monday, and in addition to stories (in text and audio) they include poetry, columns by writers such as John Clute, Rochita Loenen-Ruiz and Genevieve Valentine, interviews and essays, and — if we do say so ourselves — some of the most demanding (if occasionally controversial) criticism in the field. We also have a few fund drive bonuses. Everyone who donates to Strange Horizons this month gets entered into our prize draw. We’re adding new prizes each week, but so far we have new books by Alaya Dawn Johnson, Christopher Priest, Ann Leckie, and Lavie Tidhar, subscriptions to Lady Churchill’s Rosebud Wristlet and the Twelve Planets series of collections, knitted toys and emoji translations, and much more. Take a look. We also have a special issue, with bonus content published throughout the fund drive as we raise money. You can see what’s been released so far here — still to come we have a story by Tiptree Award-winning author Nisi Shawl, and an interview with Helen Oyeyemi, one of Granta’s latest Best of Young British Novelists, plus reviews, poetry and essays. 2013 has been a pretty good year for SH so far. Molly Gloss’s “The Grinnell Method“, which we published last autumn, won the Sturgeon Award for the best sf story of the year. The magazine as a whole was nominated for a Best Semiprozine Hugo. We’ve published (we think) some great work, and have more coming up: stories dealing with imperialism and cultural exchange, stories exploring queer YA experience, stories featuring doomsday machines and giant squid; and next week, a special issue devoted to Indian and Indian-diaspora sf. We love what we do, and we want to keep doing it. But we need $11,000 to make it happen. We’ve got two weeks left in this year’s fund drive and we’re about a third of the way to that goal — so if you like what we do, please consider chipping in. Thank you!